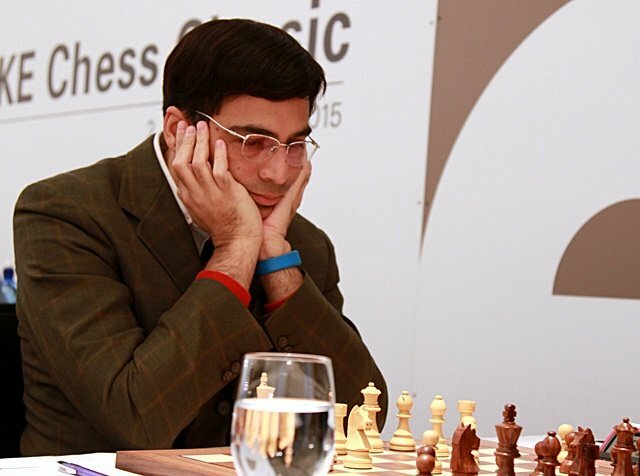 Vishy Anand finally had something to smile about at the GRENKE Chess Classic after inflicting a 4th consecutive loss on David Baramidze. He wasn’t doing much smiling, though, since the conversion of what looked likely to be the first game of the day to finish dragged on... and on. It was that kind of day. Only the headline performers Magnus Carlsen and Fabiano Caruana had a relatively straightforward draw, while Michael Adams and Arkadij Naiditsch let good winning chances slip, but in games where it was fiendishly tough to put a finger on exactly where they went wrong. 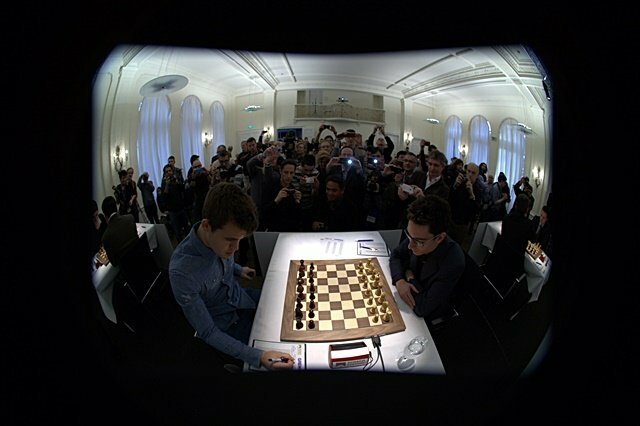 Carlsen 1/2 – 1/2 Caruana: What a knight! The first game of the day to finish was a 26-move Berlin Wall draw by repetition, but it’s hard to hold that against the players. In 2014 the two Cs played ten games and conceded only a single draw, with five wins for Carlsen and four for Caruana. You can’t even really blame the opening – up until move 11 they were following the game Fabiano won against Magnus in Shamkir, although that was decided not by the opening but a 24th move blunder. 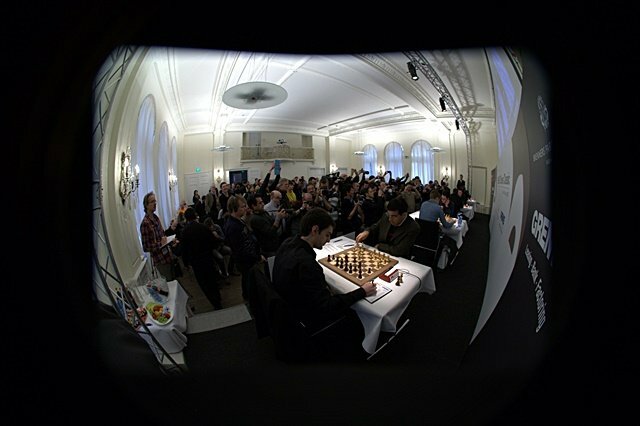 Both players executed the moves that followed with computer-like precision, and Caruana correctly chose not to try and “play for a win” at the end, since 24.Kg4 was only likely to give slim winning chances to the World Champion. The knight’s move count in the final position? 12! What has this imposter done with the real Arkadij Naiditsch? Instead of the usual roller-coaster of emotions for his fans, Naiditsch has eased to +2, with one of his victories coming against the World Champion, and has gone on to play high quality and highly practical chess – usually playing for only a draw or win. That was how things went in this impressive performance against his friend and partner in opening preparation crime Etienne Bacrot. The most impressive person related to this game, though, may have been Magnus Carlsen. 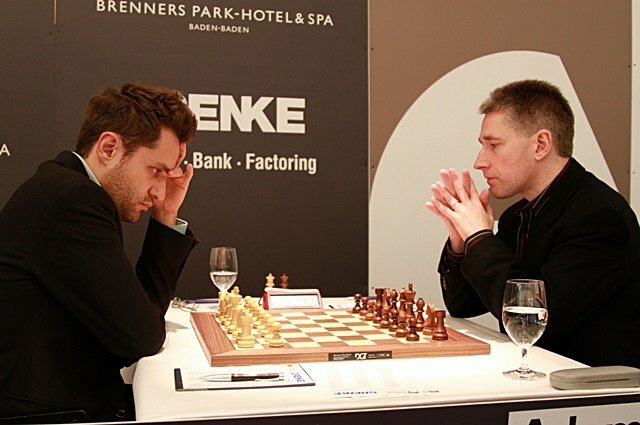 I remember some game Etienne played in the Candidates in 2007, against Kamsky, where they played some kind of Dutch. While there were a lot of operations on the kingside he was stuck with the bishop pair, but a terrible black-squared bishop, and history seems to repeat itself. After 28…Qb4 this is a little unpleasant, because you don’t get out. It just illustrated the kind of incredible pattern recognition and memory Carlsen has to draw on in his games (Nigel Short called it his "vocabulary"). The World Champion's evaluation was also spot on. 28…Qb4! seems to have been the move to keep White tied down, while after 28…Ne4? !, which had just been played, Carlsen said 29.Ne5! “should do the trick.” It did, and Bacrot had no problem holding a draw. 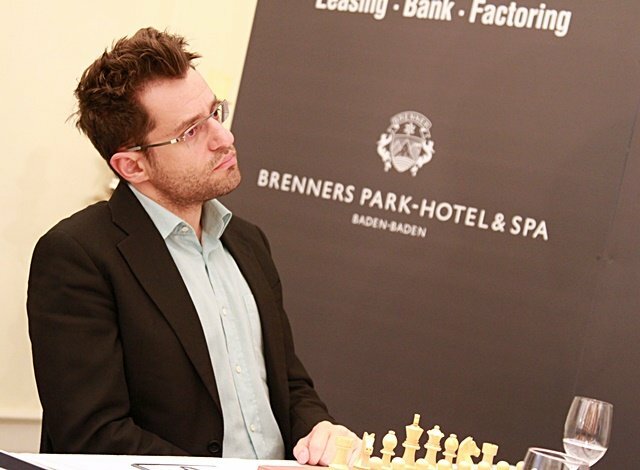 Aronian 1/2 – 1/2 Adams: Where did it all go wrong? Probably in the preparation. Nowadays they don’t play this line – it’s an old line and somehow I forgot to analyse it. There are few things in life less trustworthy that Aronian’s comments on his opening preparation after a game, but what’s indisputable is that when he played 11.d4 he was repeating what had been a novelty played by Garry Kasparov in Moscow against Vassily Ivanchuk in 1988. Vassily put his knight on e4 and lost a beautiful miniature in only 24 moves. Sometimes you have to play fantastically ugly moves, and Aronian's 22.Bxe4 is a fantastically ugly move. After 30.Qf4 I was seriously worried about 30…Bd5. I thought Bd5 was the killer! Gustafsson: What does Adams' advantage consist of? Short: He can give checkmate to the white king! Even if this is bad for White there is so much joy. Even when you’re losing you’re still enjoying your position because you get to push some pawns. By around this stage it seems as though the opposite-coloured bishops had definitely switched from being an attacking to a defensive trump, even if Aronian noted that 38…Bxe4 rather than 38…Rxe4 had still had him worried. A draw was eventually agreed on move 56. In general I don’t play very well - it’s a pretty consistent feature of all my games! This was a very strange encounter. First David repeated the “lazy” Breyer Ruy Lopez that had got him into so much trouble against Magnus Carlsen the day before. Vishy deviated from (his wording rather than “improved upon”) Magnus’ play with 17.Be3 instead of 17.Bg5, and then only four or five moves later had a winning position. It seems the whole Benoni-like structure adopted by Baramidze was a risky strategy, and 21…Rec8?! mistakenly prepared the losing 22…c3? White is clearly winning with two pieces for the rook, but instead of the game ending quickly it dragged on late into the evening, outlasting all the other games. 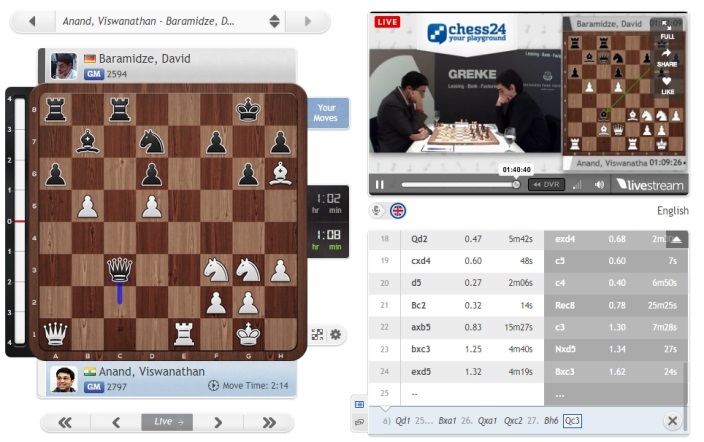 It was 21 moves before another piece was captured and only on move 65 that Baramidze finally threw in the towel, conceding his fourth defeat in a row. Perhaps Naiditsch has the toughest opponent, but Carlsen plays an unbeaten player and although Caruana takes on the struggling Baramidze he has the black pieces. If players are tied for first with the same number of points after the final round we’ll get a rapid play-off, with first two 10 min + 2 sec games, then potentially two 5+2 games and even an Armageddon decider. 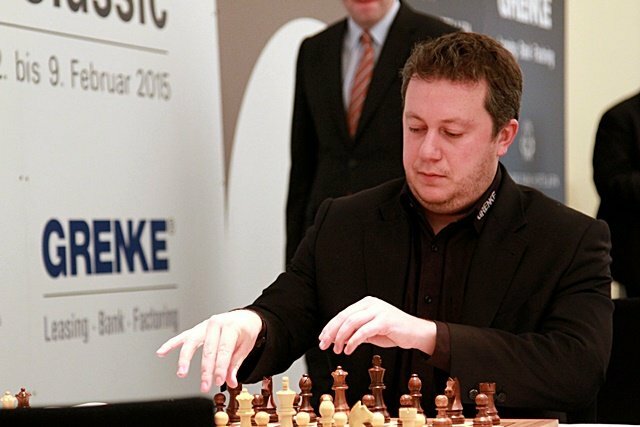 Don’t miss the last round at the same time, 15:00 CET, live here on chess24 with commentary by Jan Gustafsson and Nigel Short. Their audience is growing by the day!